In my first job AFTER I came out of university as an Information Systems Analysis graduate, my boss repeatedly used to say “remember where we are coming from, where we are and where we are heading”. This was his moto to guide us into always keeping our path and our goals in mind so we could achieve them without doubt! In those days I didn’t understand why he was saying that all the time. NOW I DO. Everybody these days speak about manifesting and about the Law of Attraction. Don’t get me wrong, the Law of Attraction is a powerful, positive and important law, but it is not sufficient in itself to guarantee success. Let me give you 3 things to bear in mind to stay on track as you embark in a life transformation journey. Determine your destination: Set clear and specific goals, write them down and make a plan to ensure you take one step at a time to know you are heading in the right direction day after day. Take the leap: You might have heard me say this often, just like Indiana Jones in the movie “Raiders of the Lost Ark”, you must take off toward your destination with no guarantee of success. 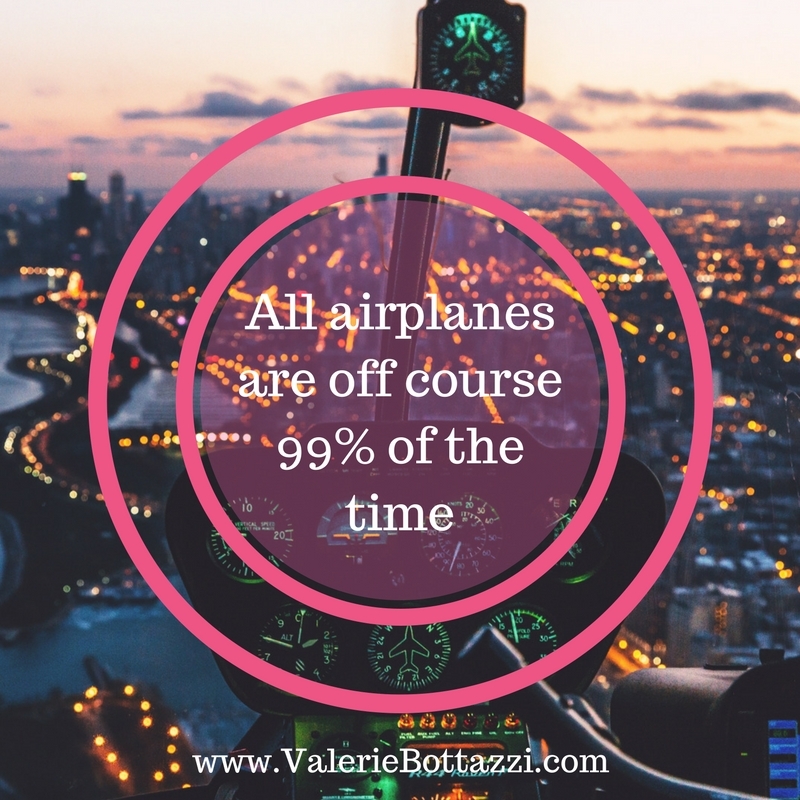 Did you know that from the time they take off ALL airplanes are off course 99% of the time??? 99% of the time! And yet, life is just like an airplane ride and your role, just like the pilot’s role, is to continuously course correct. You must be willing to stay outside of your comfort zone as you stretch yourself into uncharted territory. Thus our very important third thing to keep in mind: YOU must resolve in advance that you will never give up because you will have to take risks knowing that sometimes you will succeed and others you won’t… but a battle doesn’t make war. Continuing with the airplane example, just like any aircraft you will face headwind, storm fronts, lightning and unexpected turbulence for sure if you are in pursuit of a worthy goal. So here is the point, we never have guaranteed success in anything we set ourselves to do but it is your ability to persist in the face of all adversity while heading in the direction of your goals what will ultimately guarantee your success. It is the tenacity and the ability to hold your vision what will pull you through the darkest of nights, which by the way, is the darkest precisely before dawn. PS: andReady to “course correct”? You don’t have to go at it alone! Book a free strategy session now and let us find out if we are a good fit! Simply click on these words to book your time!! !